Dr. Marc Souris is senior research director at the Institut de Recherche pour le Développement (IRD), in the UMR 190 "Unité des virus émergents". He holds a PhD in Computer Science and a Habilitation to Lead Research. Mathematician and computer scientist by training, his work at IRD mainly concerns information sciences applied to geography and epidemiology. Since 1983, he has been developing research, innovation, software, and teaching in geomatics: geographic information systems, spatial analysis, statistics, modelling. He is the main author of the SavGIS GIS software package (www.savgis.org). The thematic applications that it has carried out during its scientific activities have focused mainly on the issue of risk, whether "natural" or "health": epidemiology, health and environment, risk analysis and prevention for natural disasters. He has also worked in the fields of urban planning, land use planning, geology and archaeology. He has taught the foundations of geomatics and spatial analysis for epidemiology and geography of health in Master II and PhD programs at the University of Paris Ouest-Nanterre La Défense and at the Asian Institute of Technology (Thailand). Marc Souris was until August 2018 IRD representative in Cambodia, based in Phnom Penh, after having been from 2013 to 2016 IRD representative for Laos and Cambodia, based in Vientiane. He has represented and promoted the Institute to local and international authorities, coordinated and animated scientific programmes, carried out scientific and institutional foresight of IRD's actions, developed partnerships (particularly in health sciences, environmental and natural resources sciences, human and social sciences). 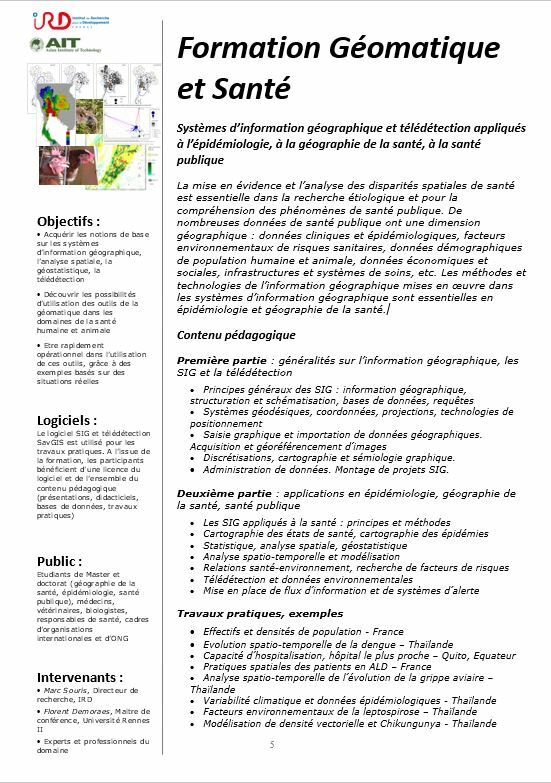 Souris M. Epidémiologie et géographie. Principes, méthodes et outils de l’analyse spatiale. Souris M, Marcombe S, Laforet J, Corbel V, Brey P, Overgaard H. Modeling spatial variation in risk of presence and insecticide resistance for malaria vectors in Laos. Gonzalez JP, Souris M, Valdivia-Granda W. Global Spread of Hemorrhagic Fever Viruses: Predicting Pandemics. Souris M. Analyse spatiale pour l’épidémiologie. Editions TI, 2016, 86 p.
Wauquier N, Bangura J, …, Souris M, Gonzalez JP. Understanding the Emergence of Ebola Virus Disease in Sierra Leone: Stalking the Virus in the Threatening Wake of Emergence. PLOS Currents Outbreaks. 2015 Apr 20. Edition 1. Souris M, Gonzalez D, Wiriyarat W, Chumpolbanchorn K, Gonzalez JP, et al. Potential Role of Fresh Water Apple Snails on H5N1 Influenza Virus Persistence and Concentration in Nature. Air Water Borne Diseases, 2015, 4: 119. Souris M, Selenic D, Khaklang S, Ninphanomchai S, Minet G, Gonzalez JP and Kittayapong P, Poultry farms vulnerability and risk of Avian Influenza re-emergence in Thailand. 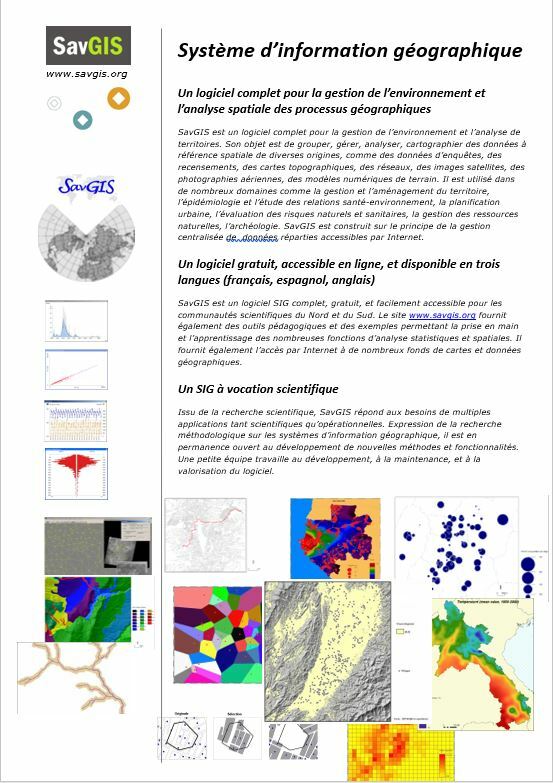 Souris M, Bichaud L. Statistical methods for bivariate spatial analysis in marked points. Examples in spatial epidemiology. 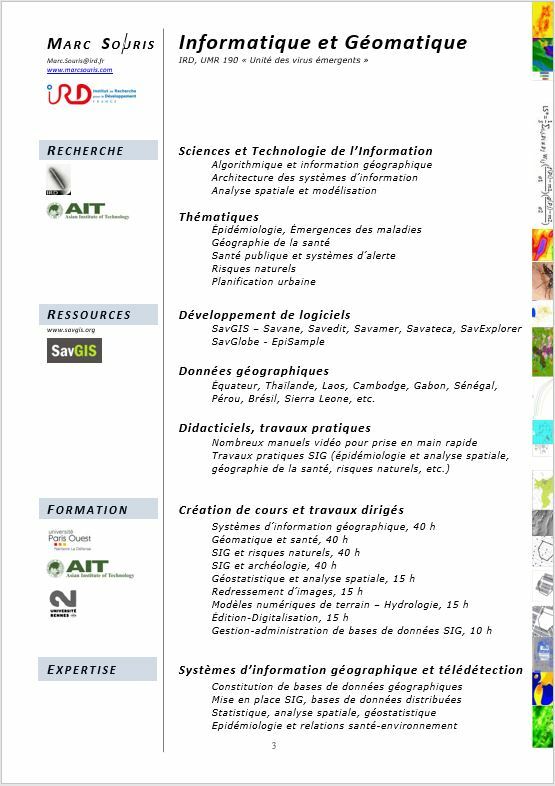 International Journal of Health Geographics, 2010 Jan 27;9:3. Souris M, Gonzalez JP. Dynamique spatiale et temporelle de l’émergence du virus de l’influenza aviaire hautement pathogène. L’exemple des vagues épizootiques en Thaïlande. Gonzalez JP, .., And Souris M. Fundamentals, domains and diffusion of disease emergence: Tools and strategies for a new paradigm. Souris M. La construction d'un système d'information dans le cadre de la coopération entre l'IRD et la Municipalité de Quito, Actes et Mémoires de l'IFEA 5, 2006, pp 39-62.